An easy to make snack that’s perfect for birthdays, baby showers, or even wedding dessert tables. Just switch the colored M&Ms to a color that would suit your theme. In a large roasting pan, or large cassorole dish, mix all ingredients except the M&M’s, sprinkles, and candy melts. Do not over fill your dish, you will need room to toss the ingredients together. Melt candy melts (or white chocolate) in a microwave safe dish (at 50% power) in 30 second intervals until almost melted. Stir until completly melted and smooth. Use a spoon to drizzle the melted chocolate over the dish of snacks. Mix as needed to coat. It’s up to you if you want the mix to be totally coated, or lightly coated (depending on the amount of melted chocolate you use). 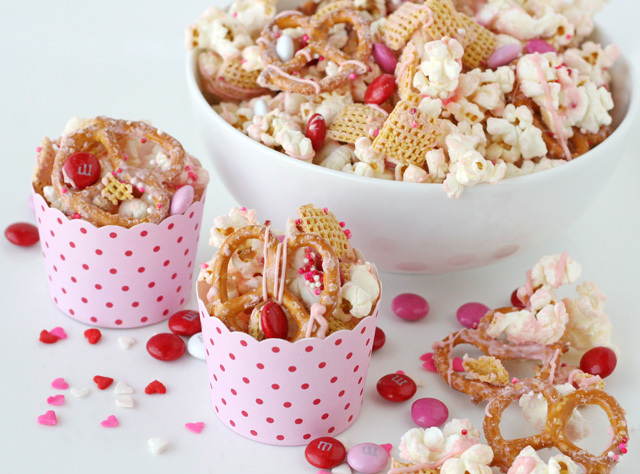 As soon as you’ve mix up the snack mix, but the coating is still warm and melty, add sprinkles of your choice, and M&M’s to the mix. Stir to combine. Spread the snack mixure out onto a baking sheet (or two if needed). Allow to cool, then break apart as needed, and store in an airtight bag or container. Party mix with popcorn in it will remain fresh tasting about 2-3 days, and a bit longer without popcorn. Fill the snacks into cute little baking cups when ready to serve. You can get these cute baking cups here.